One of the new buzzwords we hear in sport now is mind management. There is a growing mainstream acceptance in the sporting world that the ability to manage your emotions and make the correct decisions in key moments of truth is what separates the mediocre from the average, the average from the good and the good from the great. This is why sports psychologists are becoming an increasingly important component in highly successful elite sports teams. They helped elite British athletes prepare for the 2012 Olympics and the number of full-time psychologists employed by the United States Olympic Committee has increased from just one to six over the last decade. Many of the most successful elite sports teams use a sports psychologist. It’s no surprise that the idea of positive mind management is moving into the corporate world as executives seek to enhance decision making and performance in the same way athletes have done. There is likely to be some mainstream resistance and suspicion to mindfulness as it has largely been seen as the preserve of hippies, Buddhist monks and lost souls. But, this resistance is gradually receding as companies such as Google, GSK, KPMG and PwC have all started to use mindfulness, which is a kind of positive meditation and positive mind management. So, what is mindfulness, how can it be deployed in your business and does it work? Well, mindfulness is a form of meditation that helps you to relax the body and train the mind, helping us to not be a prisoner to our thoughts, but teaching us to focus on the present while calmly acknowledging and accepting our feelings, thoughts and sensations. This means that we can choose how we respond, rather than react in a less controlled knee-jerk way, and in theory, make better decisions and perform better. The infographic, developed by Jeremy Hunt, also outlines five simple meditative techniques to help you through these situations. It was published in the Huffington Post and was an excerpt from the April 2013 edition of Mindful magazine. This looks very nice and amenable but you are probably wanting to know whether it works. Well, I guess you’d have to try it and see. I have tried some of the techniques and found them helpful. 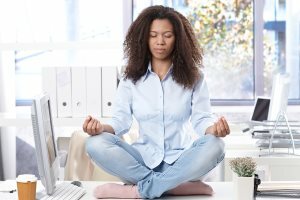 As for academic support for mindfulness, well, I did find one study from the University of Washington that showed that knowledge workers who had undergone eight weeks of relaxation training found that it had reduced multitasking behavior, which according to latest thinking is both bad for your health and productivity. Also, those who had gone through relaxation training had better memory recall of the task and were happier in their work. 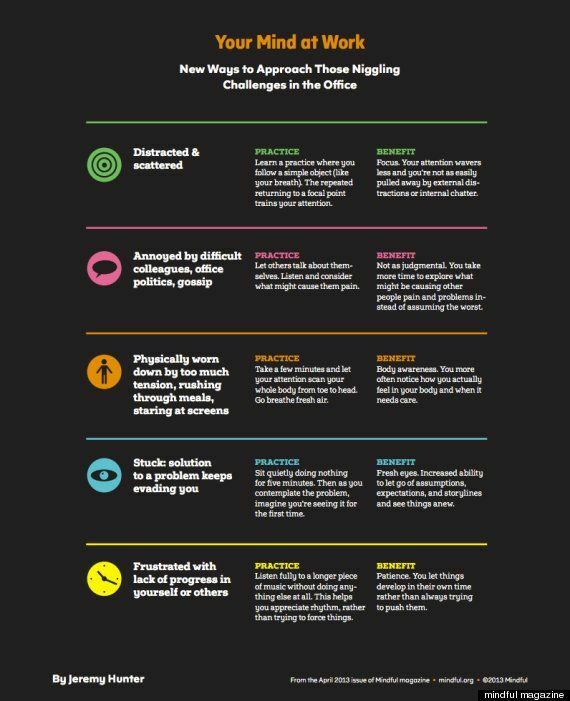 In addition to this, there are numerous studies showing that mindfulness reduces stress and increases resilience, and since resilience is thought to be a crucial element of being a Level 5 / Great Leader mindfulness training can enhance leadership performance too. Mindfulness is clearly a new and unexplored area of business coaching and mentoring, but it is an exciting area worth exploring and it could bring positive returns in increasing performance and enhancing your employer brand, helping you to attract, retain and create top talent. I think it is worth further investigation.